Set of 6 chairs designed by Finish designer Werner West in the 1930s and manufactured by Wilhelm Schauman in the town Jyväskyle in the middle of Finland. The design of the back is heavily inspired by the Greek Klismos chairs. The base is made of dark stained birch with an oxblood coloured leather seat. Some ware on the dark stain. A single feet protection are missing on one chair. Does not effect the the usage at any level. Set of four PK1 chairs designed by Poul Kjærholm and recently manufactured under licence by Thorsen Møbler in Denmark. Aluminium frame with rope seat and back. Very good condition. Set of 4 dining chairs designed by Carl Gustaf Hjort af Ornäs for Mikko Nupponen in the 1950s. Frame and legs of solid oak, cane back and new black leather upholstery on the seats. 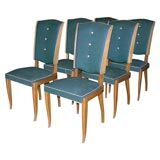 Dark wood frame side chairs with original three button back vinyl upholstery.